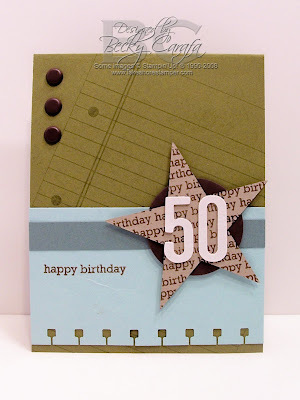 I made this card for a friend of ours who recently celebrated his 50th birthday. love this, Becky! great color combo. such a fabulous masculine card Becky!!! Love this Becky! Clean fun and funky! Nice to visit your blog after my "hopping" hiatus!!!! Great card, Becky! The colors are great! Awesome card, Becky! I love that star and the dp design. It's perfect for a 50th birthday card. Hey, I haven't used spiral punch from SU for such a long time. I'm always not sure how to apply it to my cards. Great idea!! It makes for a nice border! Very nice card! I love that lined paper stamp and the way you used your punch too! That is one awesome card!! Great card Becky! The colors and the bold lettering are awesome. Ooo, what a fantastic card! Love this!! This is awesome Becky, I love it! !